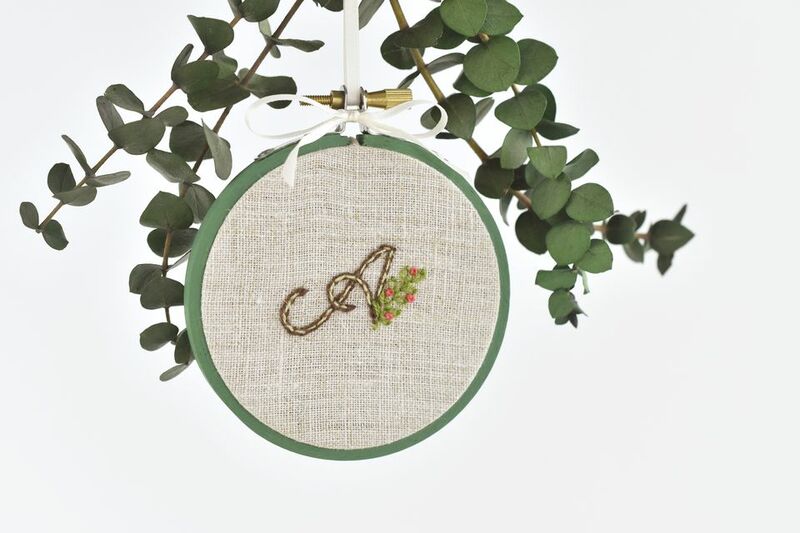 Making an embroidered ornament for Christmas or anytime is as easy as framing your stitching in a hoop! With this method, you can easily transform any small embroidery into a gift or a decoration for your tree. There are lots of ways to finish the back of an embroidery hoop. This version looks nice and crisp, while also allowing room for stitching a name or date on the back to create a keepsake. When choosing what to stitch, consider small Christmas designs, images that represent your ornament's recipient, beautiful florals, monograms or even some already completed embroidery from your sample stitching! Start by painting your embroidery hoop in a color that coordinates with the embroidery for the ornament. You should only paint the outer hoop. Use as many coats as it takes until it reaches a level of coverage that you like. This step is optional, but adding some color to a hoop gives it a finished look. You can also try other ways to embellish a hoop, such as adding sparkles. While the paint is drying, trace the outside of the inner piece of the embroidery hoop on thin cardboard. Cut out the circle. The more precisely you cut the circle, the better, making sure that you don't cut it too small. Use a dab of glue stick to attach the cardboard circle to the back of the non-embroidered fabric square. Be sure that the plain side is down so that any printing doesn't show through the fabric. Note: If you'd like, you can embroider this piece of fabric before starting this step. Although it will be the back of the ornament, it's a great place to add a name or a date. Cut the fabric around the circle leaving about 1" all around. This doesn't need to be as precise as the cardboard circle. Use a needle and thread to stitch around the edge with running stitch, pulling to gather the fabric and tighten it around the cardboard circle. Secure the thread with a knot. Secure the finished embroidery in the painted hoop. The inner hoop should push the embroidery through to the front so that it protrudes slightly. Trim the excess fabric, leaving about 1/2" all around. Run craft glue around the back edge of the inner hoop and press the fabric down to the hoop. You may need to hold it for a minute or so until it sticks. Take care so that the glue doesn't soak through to the front of the hoop. Run a line of craft glue around the back of the hoop on the fabric-covered inner hoop. Place the covered cardboard circle with the gathered side down on the glue. The smooth side should be showing and making the back of your hoop look beautiful. Set a heavy object on the back of the hoop while the glue is drying. Tie a bow around the metal hardware at the top of the hoop. Tie a ribbon hanger through the hardware and knot at the top. If you chose not to add an embroidered name or date to the backing, you can add initials or a year along the edge of the hoop with a paint pen to finish it off. Your embroidered ornament is ready to give as a gift or decorate your tree!